Testimonial Pure Yoga North Austin Student. My yoga practice and pregnancy. I have been practicing Bikram Yoga (Original Hot Yoga) since 2011. I started Bikram yoga as a way to supplement my half-marathon training which I started because I was grieving the loss of my father. Yoga helped me a lot when I was grieving and still does. It has been a big part of my life through all the major and minor transitions. Yoga is part of my East-Indian heritage. I grew up watching my grandfather practice yoga every morning and start his day. I cannot imagine my life without yoga and honestly do not want to. So, when I became pregnant, it was only natural that yoga became a part of my pregnancy journey. A lot of pregnant women get told things they should avoid. Bikram yoga was one of the things my OBGYN told me to avoid and to “switch” to prenatal yoga because it was “safe”. I found myself feeling dis-empowered and knew that I needed to find a care provider that supported my choice to do something that I have done for over 10 years and has benefited me immensely. I then switched my care to a midwife. I found out that I was expecting when I was only 5-weeks pregnant and I remember that it was a Friday. I was back in the hot yoga room on the following Monday. My pregnancy was low risk, however, I had morning (all-day) sickness from hell. I threw up 4 times a day and was nauseous all the time. My nausea and vomiting lasted all 9 months with the frequency slowing down as I got into the third trimester. I never stopped practicing yoga though. I kept myself hydrated and listened to my body. The teachers were so kind and understanding. I learned all the modifications from Afton (teacher at PURE Yoga Texas) and practiced my heart out. I would take breaks during class as needed and stayed towards the back of the room. When Monica(teacher at PURE Yoga Texas) was teaching she would keep a close and kind eye on me and would open the door for me to cool off. She was in-tune with my practice and could often tell if I needed a blast of cool air. 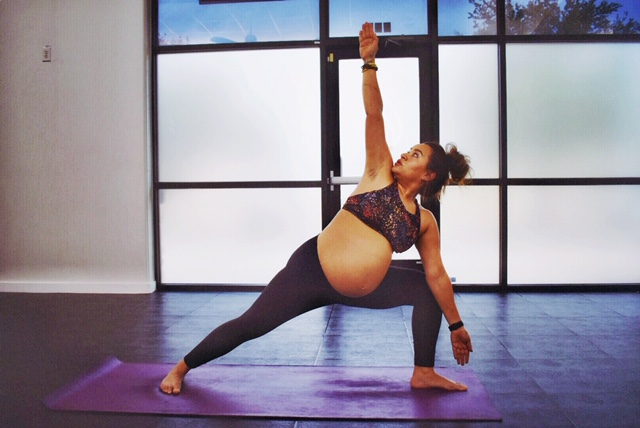 Yoga contributed to me having a ‘healthy’ pregnancy. I never got swollen feet and ankles, my weight gain was only 11 lbs, I was mentally so much at peace with all the changes in my life that were occurring. Yoga also helped me deal with the amount of stress that morning sickness caused me. From all of us at PURE Yoga Texas….Congratulations Shaina!